Bro  is high-quality security monitoring tool designed to discover and analyze traffic trends on your network. Bro provides in-depth analysis of network traffic without limiting itself to traditional signature-based approaches. I first heard about the Bro network security monitoring framework when a consultant friend of mine talked about melding the world of big data and security together. My friend believed that traditional signature-based intrusion detection and monitoring simply wasn't enough to ensure a secure network. The problem with networks is that, because of the increased number of devices, services, and tools used today, it's easy for attackers to enter networks in many different ways. Ransomware, botnets, malware, and remote control tools are readily available. Social engineering is especially prevalent now. Traditional intrusion detection and perimeter security tools just aren't up to the task. Traditional monitoring tools are also having a hard time catching all of the anomalies. Bro, however, takes a different approach. The Bro framework is designed to monitor traffic on any layer. The default focus is on application layer traffic, but you can train Bro on any layer of the OSI stack. Bro is not really signature-based in its approach; it reviews traffic and looks for anomalous patterns. However, Bro also looks for similarities. It is ideal for setting baselines. Like many projects, Bro offers extensive commercial support. Monitoring engine: Software that listens to a network segment and reviews network traffic. This monitoring is similar to what Snort, Ntop, and other tools do. The engine also includes the event handler, which is designed to identify traffic and then act according to its configuration files. Policies: Files that determine how Bro will search the network. In addition to the monitoring engine, these policies are central to Bro's more novel approach to monitoring trends rather than focusing on known signatures. Logging engine: A component that organizes the information Bro captures. With so many security projects in the open source/Linux space (see the box titled "Event Monitoring Tools") it is difficult to get excited about the latest and greatest software project. But Bro is a bit different. It's designed to fit a specific set of needs. Bro also happens to have been created at an appropriate time: It lets the user monitor events and then sift through them to find actionable information, not just data. Several powerful event monitoring tools are available today, including Snort  and AlienVault (OSSIM) . Each has its strengths. Snort remains the premier signature-based IDS tool. OSSIM adopts a similar approach to Bro. I wouldn't include Ntop  or Nagios  in this list. Both Ntop and Nagios are terrific software, they do monitoring, and they are actively supported. Yet Ntop is not designed to identify long-term security issues and trends. Nagios monitors network systems and servers; although it has a useful security component, it does not gather long-term information. Long-term attack analysis: It's not enough these days for IT professionals to set up real-time alerts of short-term scans. We all know that hackers are spending weeks and months surveilling and enumerating systems. Therefore, it's vital that today's security workers spend considerable time creating solutions that catch long-term attacks. An understanding of the unexpected places where the attackers are hitting them: Remember that old Monty Python skit where the folks storm in and yell, "No one expects the Spanish Inquisition?" CIOs and CISOs everywhere keep experiencing the hacker version of that joke; only, the results aren't so funny. Visualization: Business and IT professionals want easy-to-read representations of complex data. Bro is really good at long-term attack analysis and understanding unexpected attacks; with a little help from its friends, it can also start you on the path to better visualization. It's best to install Bro from source. Although RPM and DEB binary packages are available, I have found they often don't work at all, or else they are missing some of the necessary software. The Kali Live Linux distro, a popular tool for penetration testing, comes with Bro installed by default, but I've found the Kali version doesn't work very well, either. You could try your luck, and your mileage may vary when it comes to the ready-made installation binaries that exist out there, but I know for a fact the source code installs on my Ubuntu 16.04 and Linux Mint systems. The latest, stable version of Bro is 2.4.1. This latest version is the best documented version, and it works quite well. For those of you who have more intrepid natures, the 2.5 beta is available at the Bro website. I'll be sticking with 2.4.1 for this article. Note: If you want to use Bro on a switched network, you will need to position Bro on a switch that allows your Linux system to monitor the entire network. Start by installing the required dependencies. The dependencies, which are listed at the Bro website , include libpcap , OpenSSL, the BIND8 library, libz , Bash, and Python. Installing from source requires additional dependencies, including Swig, Bison, and Flex. I found that each of these dependencies was quite easy to install. If the PATH export doesn't work, you can also edit the /etc/environment file so that all new terminal instances can readily find where Bro is located. The /etc/init.d/bro command starts scripts that you can use to directly stop, start, and restart the application. 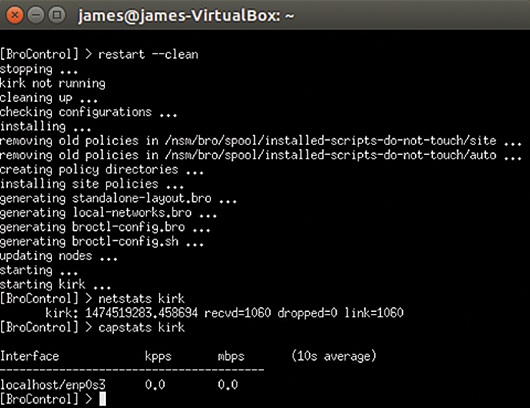 The broctl (BroControl) command starts an interactive shell. You will live in this shell and use it to configure and manage the entire framework. With this command, you can activate interfaces, view statistics, and change the way Bro operates. Don't worry – it's a pretty intuitive environment. 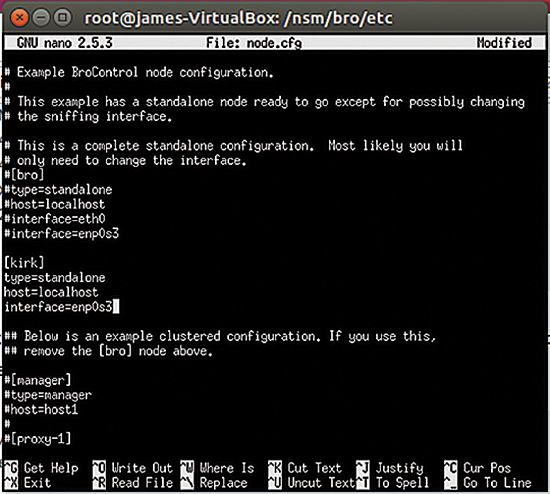 Bro uses nodes to control its framework. A node basically ties Bro's detection engine and rules to a particular interface and to a role. You configure a node in the /nsm/bro/etc/node.cfg file. Standalone: the system runs as a single node. If you are configuring a Standalone node, then make sure all other node types are commented out. Manager: the most powerful configuration after Standalone – used by those who not only want to view packets but also make changes to how Bro operates. Worker: For nodes that only view statistics. node.cfg: where you create nodes. networks.cfg: where you specify the network to monitor. broctl.cfg: allows you to configure mailing options. Start by configuring Bro so that it knows how to behave and knows the network. The node.cfg file determines how Bro will act. The networks.cfg file simply should include your current network, as well as any networks you want Bro to audit. When editing node.cfg, it is possible to configure different nodes for the same interface. For the purposes of this article, I'll run Bro as a Standalone node. The first step is to configure the /nsm/bro/etc/node.cfg file (see Figure 1). Figure 1: Configuring the node.cfg file. The default value is bro, but I decided to use kirk instead. Notice that the kirk node lists my own system, sets it up as a standalone system, and then specifies the interface. In this example, I'm using a virtualized Ubuntu system on a new-ish Ubuntu host, so the interface name is enp0s3 , rather than something standard such as eth0 or wlan0 . you'll be placed into the interactive session, as shown in Figure 2. Figure 2: Re-reading the configuration file and viewing statistics in BroControl. status: Used without arguments, the status command shows the status of all nodes. You can also specify a node (e.g., kirk) to view only that particular node. deploy: Re-reads all system configuration files without restarting the Bro daemon process. You use this command without arguments. netstats: Provides statistics concerning all activated interfaces. scripts: Reports the scripts that Bro is using. top: Shows how much memory Bro is using. See the Bro documentation for more on Bro commands .